Reaffirming the Kingdom of Bahrain’s position as a key strategic location in the Gulf, the aircraft on display at the Bahrain International Airshow (BIAS) being held November 14th-16th 2018, proved to be one of the best in the Middle East, featuring three fastjet aerobatics teams. The event took place at Sakhir Air Base, home of Bahrain Amiri Royal Flight. The famous Russian Knights performed their skills twice a day and were joined by the UAE’s Al Fursan display team. Italy’s Frecce Tricolori – making their debut on BIAS – completed a truly international spectacle of formation flying expertise. In a total of 100 aircraft attended the 2018 edition. Military jets were a dominant feature with highlights including F-16, Typhoon, Mirage and the F-35. Besides the military, commercial aircraft like Airbus 320 NEO and Boeing B787-900 performed flying displays. Gulfstream, Embrear, UAE and Bell were also showcasing aircraft on static display. Traditionally, the US Navy and US Marine Corps are well represented on the BIAS. 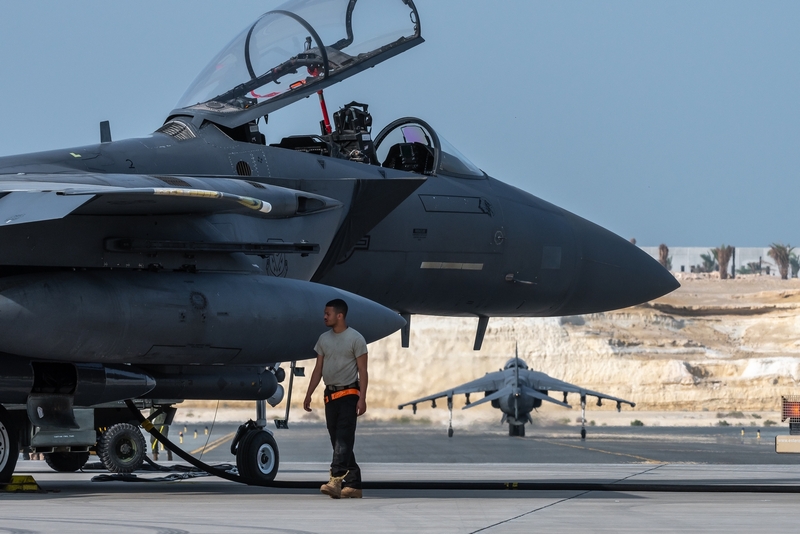 The United States armed forces have been using the facilities on Shaikh Isa Air Base, which is located on the south side of the island of Bahrain. Due to the military intervention against ISIL the United States have deployed various aircraft there. In addition, you can also regularly find an expeditionary unit of the USMC. This edition of BIAS the USS Wasp, a United States Navy multipurpose amphibious assault ship, was moored in the area. In 2018, a detachment of 6 F-35Bs from VMFA-121 is deployed with the ship, marking the first operational shipboard deployment for the F-35B. The fact the airshow grows and clearly gains regional influence, is economically important for a small country such as Bahrain. By offering an international event like BIAS, it explores ways to not only depend on oil yields. The momentum is well chosen: commercial aviation is still growing and from a military point of view, the Middle East is a very interesting market due to rising political tensions. In recent years, countries such as Saudi Arabia, Quatar, United Arab Emirates and Bahrain have been strengthening their air forces, and still are. 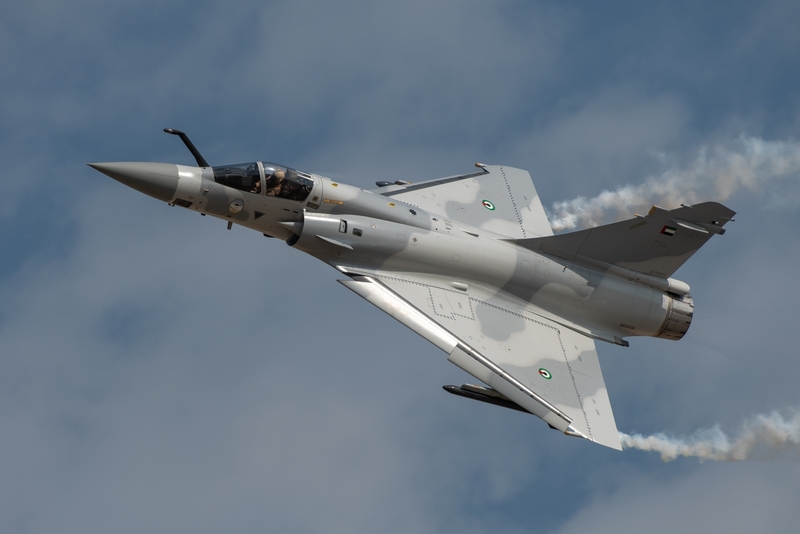 BIAS was therefore used by the Royal Bahraini Air Force (RBAF) to confirm a number of potential purchases and forthcoming contracts. To emphasize its build-up of combat forces, RBAF affirmed an order for attack helicopters at the Bahrain Air Show. The deal through the US foreign military sales (FMS) programme, concerning 12 Bell AH-1Z Vipers, estimated to be worth $912 million. The aircraft will be delivered from late 2022 to early 2023. 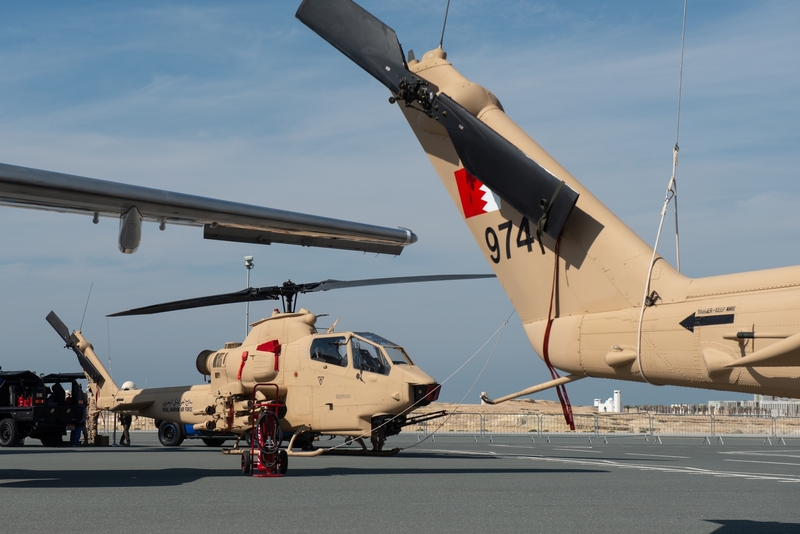 In addition to the helicopters, Bahrain has requested T-700 GE 401C engines, AGM-114 Hellfire missiles, the Advance Precision Kill Weapon System II and M197 20mm gun systems. For navigation, targeting and planning, this request also includes Honeywell Inertial Navigation System (INS), Joint Mission Planning Systems, Tech Refresh mission computers, AN/AAQ-30 Target Sight Systems, Helmet Mounted Display/Optimized Top Owl, communication equipment, electronic warfare systems, APX-117 IFF system, AN/AAR-47 missile warning systems, AN/ALE-47 countermeasure dispenser sets and APR-39C(V)2 radar warning receivers. 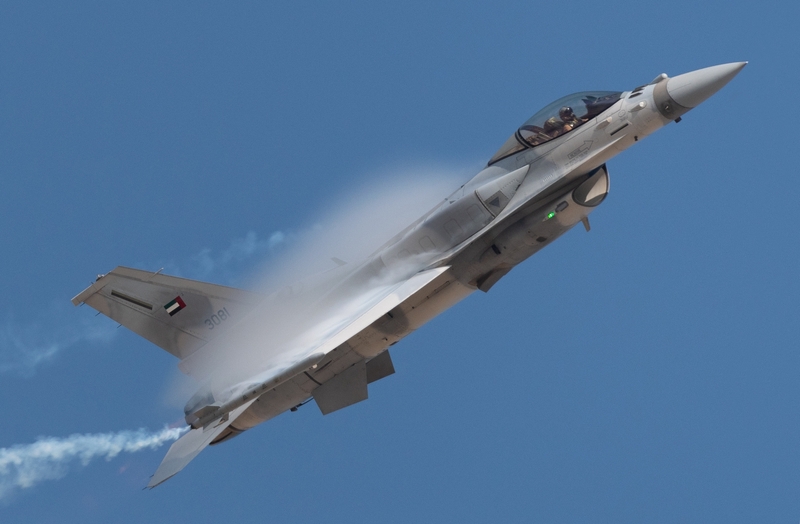 Asked whether the new AH-Z would replace or supplement the earlier examples, the head of the RBAF, Major-General Sheikh Hamad ben Abdulla Al Khalifa, said: “It will add the existing Cobras. We decided to go for an additional number because we realized that the AH-1Z would give us an additional capability in maritime operations.” That fits in Bells commend, the AH1-Z model was created ‘from the ground up’ with a maritime capability and was designed to be operated from ships. Currently, this particular version is flown by the US Marine Corps. The RBAF already has an estimated 20-plus earlier-generation Bell AH-1Es and Fs, based at Rifa’a Air Base. By the end of next year, all 18 AH-1Fs are due to be upgraded by Turkish Aerospace (TAI) using the avionics fit from its T129 attack helicopter. This upgrade provides a glass cockpit and multi-function displays using Aselsan’ avionics structure. First, a prototype was upgraded by Turkish Aerospace at its Ankara facility, and had its maiden flight in September 2017, before being delivered back to the RBAF in 2018. The other AH-1Fs will be upgraded in Bahrain. 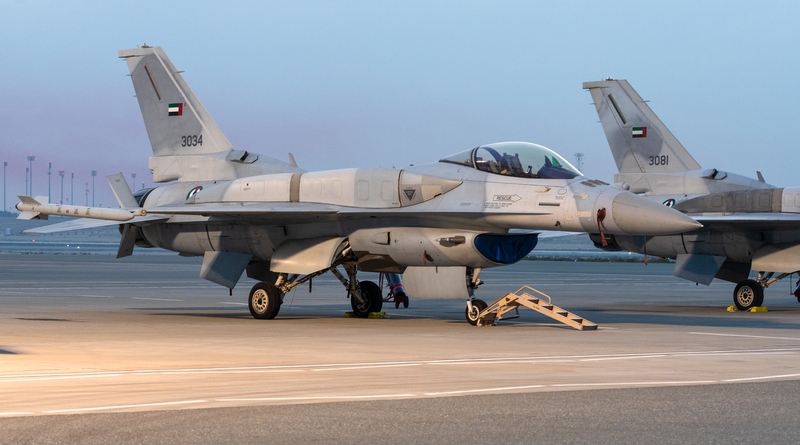 Bahrain has been looking to acquire new fighter aircraft for some years to replace its ageing F-5E/F Tiger IIs and supplement the existing F-16C/D Block 40s. The Eurofighter Typhoon had also been a candidate for the requirement, but the F-16V latterly became the preferred choice. 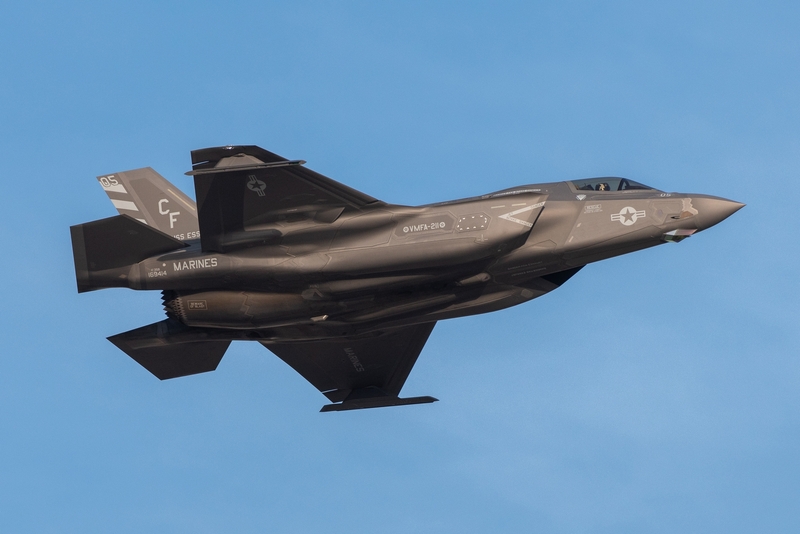 Late 2017, a contract valued at $3.8 billion has been concluded with Lockheed Martin. The US State Department approval had been granted for purchase of 19 F-16C/D Block 70s (F-16V) for the RBAF at an estimated cost of $2.785 billion. The deal also includes options on three additional aircraft. At the same time approval had also been given for upgrade of the RBAF’s existing fleet of 16 F-16C Block 40 and four F-16D Block 40 aircraft to the F-16V configuration, at an estimated cost of $1.082 billion, including a package of weapons and equipment. The F-16V is suitable to launch a variety of latest air-to-air and air-to-ground weapons. Bahrain ordered training suits for AIM-9L/X missiles, AIM-120C-7 Advanced Medium Range Air-to-Air Missile (AMRAAM), GBU-50 Enhanced Paveway II, GBU-54 Laser JDAM and AGM-154 Joint Stand-Off Weapon (JSOW). The very versatile F-16V is equipped with General Electric F-110-GE-129 engines, a new Northrop Grumman AN/APG-83 scalable agile beam radar (SABR), as well as upgraded displays and avionics suite. The new build Block 70s will have a service life extended to 12,000 hours, an increase of 4,000 on the current F-16 fleets. The first jet, a dual-seater, is expected to roll off the new Greenville facility production line in South Carolina, USA, during December 2021, with deliveries expected to start in 2022. The current F-16 Block 40 fleet is split between the 1st and 2nd Squadron, based at Shaikh Isa Air Base. 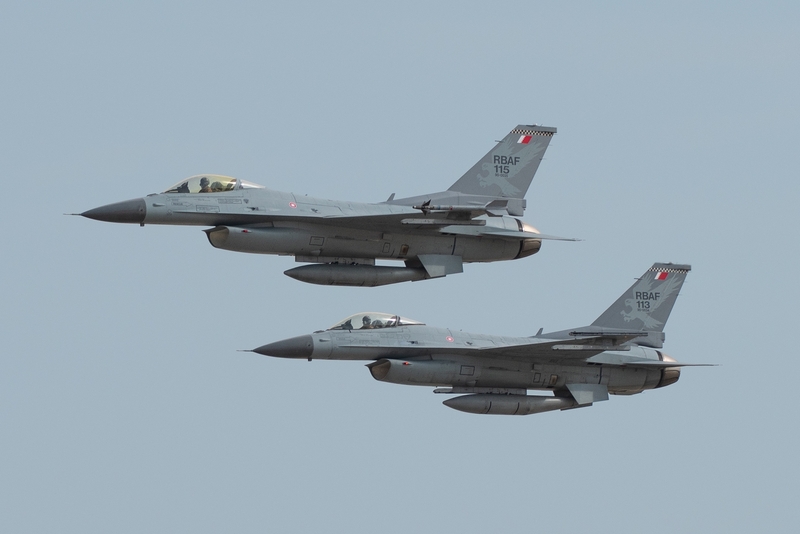 A total of 22 F-16s – two of them were lost – were delivered in two batches, in the years 1990/91 and 2000. The second batch differs from the initial F-16s, as they house an APG-68(V)-8 radar. A color cockpit TV system and the capability to launch the AIM-120B AMRAAM, as well as the AIM-9M Sidewinders for the air defense role. They fulfil a round-the-clock quick reaction alert status, ready to scramble at any time to intercept intruders into Bahraini air space. When the new F-16Vs arrive, it will announce the end of the operational life of the eight F-5E and four F-5Fs currently active with 6 Squadron. Delivered in 1985, the F-5E/Fs are used as lead-in fighter trainers for dissimilar air combat training (DACT), and in the anti-shipping role by the RBAF. However, the future of the small supersonic F-5 Tigers is now under reconsideration, and there is a possibility they get a next life, as be kept flying in the aggressor role. 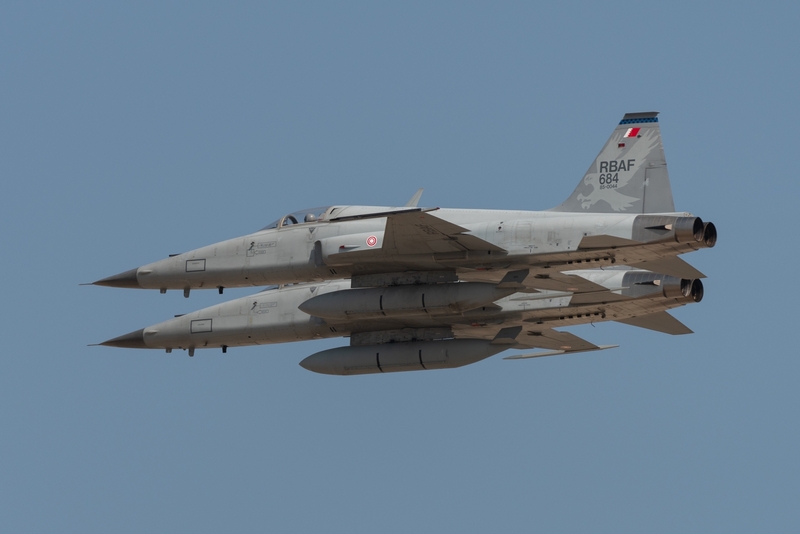 The characteristics of the F-5 – sleek, hard to identify and with an afterburner engine – have made the aircraft ideal for DACT. According to one source, the cost of upgrading them with the necessary systems would be no more than buying a brand-new F-16 Block 70. The rising costs of flying new-generation front-line aircraft, and to save flying hours on them, would mean the Tiger could be an attractive option. The GCC countries – Bahrain, Kuwait, Oman, Qatar, Saudi Arabia, and the United Arab Emirates – are in desperate need for this kind of training capability. None of these air forces have a dedicated aggressor aircraft, then it is possible they could get support with the costs of upgrading them. In August 2017, for additional tactical air transport, two former Royal Air Force C-130J Hercules C5s have been purchased. After a major defense and security review in 2015, United Kingdom decided to withdraw ten C-130J Super Hercules from service. 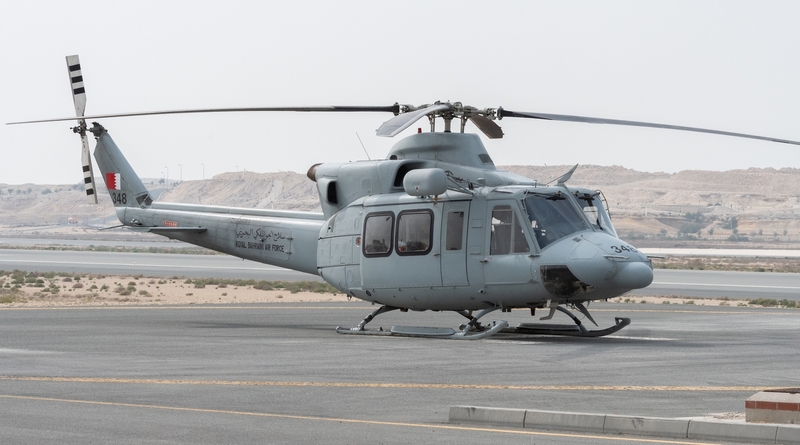 Recently, early November, the first one was delivered to the Royal Bahraini Air Force, and attended the Bahrain International Air Show. The second one is currently being prepared for delivery by Marshall Aerospace Group at its facility in Cambridge. They comprise ZH880 and ZH886, and respectively allocated to RBAF serials 701 and 702, now registered to the Bahrain Amin Flight. Asked if the new helicopters – on top of the recently order for Lockheed Martin F-16 Block 70 fighters and the arrival of the first of two C-130 Hercules tactical transports – would place strain on pilot resources, Major-General Al Khalifa said the RBAF had started recruiting technicians a few months ago and was already into the selection process for pilots. Notable was that during the BIAS at Sahkir Air Base large numbers of military personnel serving the Royal Bahraini Air Force were recruited from Pakistan and India. Logically, then, the question is whether this route will also be used when selecting air crews. 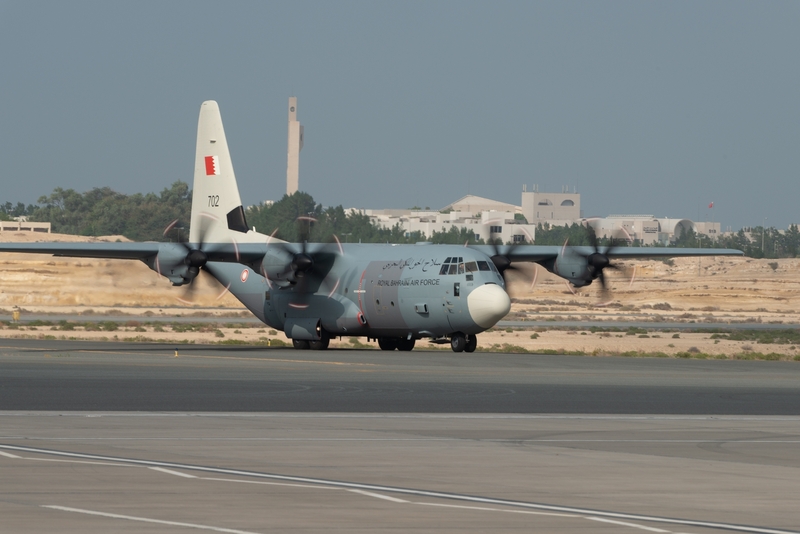 Bahrain has renewed investment plans for the RBAF – money to ensure it can look after its own defense needs also that of its neighbours if required. 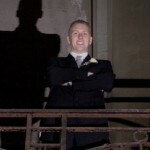 The result is a well-equipped organization ready for the future.